Perched on the Black Sea’s coast, this rather romantic monument is ironically a one withstanding a dark bygone romance. 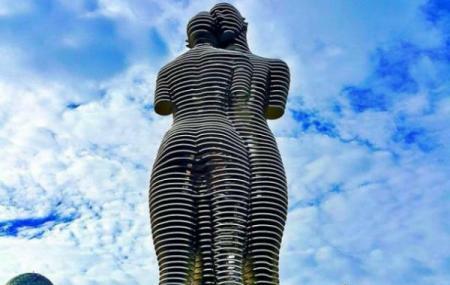 As you wander through Batumi, with the fresh sea breeze enticing you to the beach, you will spot two life-size steel statues. Much to your wonder these, human figures depict an eternal love story and this monument as on ode to two lovers will melt your heart! Unfolding the romance of a Muslim, Azerbaijani boy - Ali with a Christian, Georgian princess – Nino from the legendary romantic novel ‘Ali and Nino: A Love Story’, the attraction will leave your jaw dropped. Standing tall at 8 meters, these statutes move at 7 pm to come close for a brief embrace before moving apart illustrating their heart-rending separation owing to the invasion of Soviet Russia. This entire movement spans a period of 10 minutes. Adding to the mysticism of this story, the novel’s author too is a queer Kurban Said, whose identity has been a topic of dispute for several years, after the novel got published in 1937; albeit being published in 30 languages. Sit back and relax on the beach as you watch this love story unfolding before your eyes! The statues begin to move at 7pm, daily so this is the perfect time to catch the action. How popular is Monument Ali And Nino? People normally club together Alphabetic Tower and Chacha Clock Tower while planning their visit to Monument Ali And Nino.